A tintype is a photograph created on a thin sheet of iron, not on a sheet of tin as the name implies. Tintype photos were in frequent use in the USA during the 1860s and their popularity continued for several decades. Some of the most well-known tintype photos from early eras include photos of cowboys and outlaws as well as scenes from the American West and the Civil War. Today, some tintypes are highly collectible and therefore sell for impressive sums, while others are affordable for almost anyone. Below are tintype photos featuring cowboys, horses, or outlaws for sale. For more information about tintype photos, please scroll down beneath the cowboy tintypes for sale. 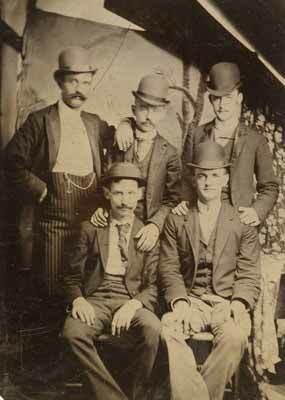 Below: This is a well known tintype photo, circa 1892, of five members of the Wild Bunch outlaw gang. For more information on this photo please scroll down. This photo is in the public domain in the United States: PD-US. eBay and Etsy are both excellent sources to find cowboy tintype photos in all sizes, ages, and prices. This area lets you compare price and selection from both of those major sellers all on one page! The tintype photograph rose to prominence in the United States in the 1860s. Compared to other photographic methods of the time (such as the ambrotype and the daguerreotype) the tintype was comparatively fast and easy to make. In addition, the resulting photo was more durable and didn't require being placed in a protective case like the other two methods. Note: While tintypes didn't require being placed in a protective case some people chose to do so out of habit or aesthetics. At first tintypes were primarily taken in photographic studios, but they soon became widely used outside the studio as well. The equipment and supplies needed to create a tintype could be easily transported (comparatively speaking, at least), the process was typically affordable to a wide range of people, and the tintype photograph itself was durable. Tintype photography captured many unique moments in American history. The photo below was taken at a county fair in May, 1903. 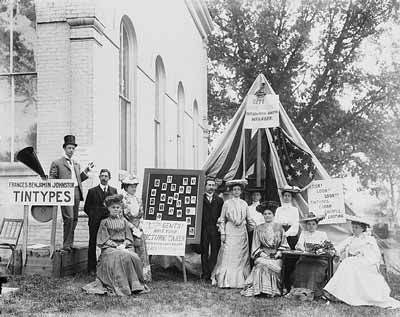 The description with the photo reads: "Photograph shows photographer Frances Benjamin Johnston, with women and men outside a tent offering tintype portraits, at a county fair. Sign next to tent reads 'Frances Benjamin Johnston, tintypes.' "
Photo from the Library of Congress.. No known restrictions. Frances Benjamin Johnston Collection, Prints & Photographs Division, Library of Congress, LC-J713- 4931. You may have noticed that many of the people, and even the animals, in a tintype photo look stiffly posed or even rigid. That's because exposure times with tintype photos are slow (several seconds) and any movement would create blur in the resulting image. Therefore, photographers often encouraged their subjects to remain as still as possible while the photo was being taken. Below are good things to know before buying tintype photos on the Web or anywhere else. Is it really a tintype photo? Some people use the word "tintype" to refer to any photo from a bygone era, or a photo from a more recent era that has an "old-timey" look even if the photo is printed on paper or in some other way is not truly a tintype. In many of these cases the people are honest, just confused about what should properly be called a tintype. Other people, however, might intentionally try to deceive someone about whether or not a photo is actually a tintype. For a little help in distinguishing fake tintypes from the real thing, you might like this page: https://www.realorrepro.com/article/Photographic--Images . Is the tintype from a recent era, or is it much older? There are still photographers using the tintype photographic technique to create new photos every day, so a tintype doesn't necessarily have to be an old photo. How big is the tintype (length and width)? Keep in mind that many older tintypes are small by today's standards, and getting a size perspective can be difficult just by looking at images. Be sure the seller tells you the size. What condition is the tintype photo in? If it's an older photo it's reasonable to expect it might have some defects of some kind. The seller should clearly describe any scratches, scuffs, or other damage and show them in the pictures if possible. Who is the photographer? In many cases the photographer might be unknown, but if he/she is known it might add to the overall value - monetarily or sentimentally - of the photo. How soon after the sale is over do you have to pay for your purchase? Some sellers require the item be paid for within a certain time frame or the sale is off. Read the item's description for acceptable payment times and terms. What payment methods does the seller accept? How soon will the tintype be shipped after you pay for it? Will the seller ship to your area? Where is the tintype currently located? Will it be shipped from this location? How long will it take to arrive? How will it be packaged for shipping? How much will the shipping charges be? Will your purchase be insured? If so, is it included in the shipping or will it cost extra? Does the seller accept refunds? Don't assume they do, because some don't. If a seller does accept refunds who is responsible for the cost of return shipping? (Hint: It's probably you.) Will there be a restocking fee? Keep in mind that a valuable or collectible cowboy tintype can be expensive, and, therefore, the restocking fee might also be expensive. If you have any questions about a cowboy tintype be sure to ask the seller before you bid or buy. Look for the "Ask a question" link in the "Questions and answers about this item" area to ask your questions. While some sellers of highly collectible cowboy tintypes or other items on eBay and/or Etsy have had numerous transactions and therefore a lot of feedback, it's not uncommon to find sellers who only sell an occasional item that is rare or highly collectible. In a case like this a seller may have had only a few transactions and therefore very little feedback. Just make sure that any seller you consider doing business with has very good feedback as a seller, even if it's only a small amount. Many people have successfully and happily purchased all kinds of items on eBay and Etsy. They have both become terrific places for buyers and sellers from all areas of the country and the world to sell and buy items like cowboy tintypes that they wouldn't otherwise have access to. As with any transaction on or offline, though, make sure you thoroughly research the item you're interested in as well as the seller offering it for sale. This well known tintype photo of five members of the notorious Wild Bunch outlaw gang, circa 1892, is from the photographic collection of famed Old West photographer Camillus S. Fly (1849-1901). The Wild Bunch was famous for robberies in the American West during the late 1800s and early 1900s. Pictured, clockwise, from the top left: Kid Curry (Harvey Logan), Bill McCarty, Bill (Tod) Carver, Ben Kilpatrick, and Tom O'Day.